Our Classic Car Show aimed at bringing owners of cherished cars together, ranging from vintage era to modern day cult classics and showing them off to the public.There will be plenty of food and drink all from local suppliers; singing from the wonderful liberty sisters so we envisage a fun day of chatting, laughs and in depth petrol, head based debates! There will also be a chance to win a prize for your car in our competition categories, with prizes kindly sponsored by local businesses. If you would like to book your car in, please complete below information and return it to us with your payment of �5.00 per car- payable in advance by chq made payable to Estuary League of Friends. You will then be issued with your car entry permit. 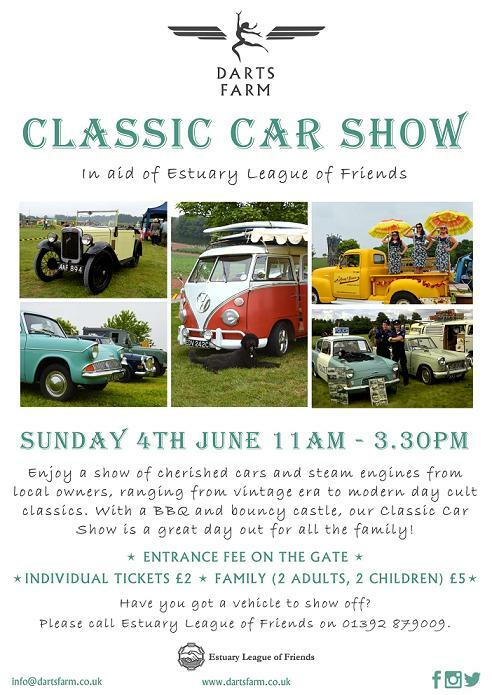 We would like to invite any vintage vehicles to attend, scooters, tractors, motorcycles, traction engines etc,Last years Classic Car show was a huge success. We tasted some incredible food and drink from; Flaming Good Pizza Co, Eat the Smoke, Darts Farm Premier BAR Services and Antonio�s. We heard some fantastic music by The Liberty Sisters and The Sun Dogs. 225 cherished cars and bikes came last year, so lets push to beat that number. We manged to raise nearly �5,000 for our charity and we couldn�t of done it without you who all that came.